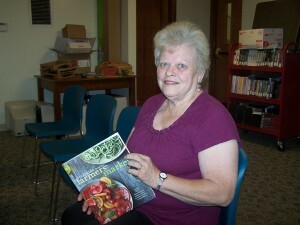 The latest in an ongoing series of nutrition programs took place on Monday, Sept. 10 at Milford Public Library. Did you know that Sept. 2-8 was “Going Local Week?” Residents of Indiana were asked to celebrate “Going Local Week” by eating one Indiana local food at each meal that week. Choosing locally grown and produced foods allows you to enjoy fresher and more varieties of food and helps support the local economy. Younce suggested visiting a local farm or farmer’s market, go to a U-pick field and pick berries, or preserve some fruits or vegetables for the winter months ahead. She demonstrated how to make zucchini dip, steamed carrots and onions, Italian basil tomato salad, zucchini, corn and tomatoes, and fruit yogurt pudding. Lou Lovell won a copy of Gooseberry Patch Fresh from the Farmstand book and Shirley Pitney won Cooking from the Farmer’s Market, by Tasha DeSerio. Those two titles are also available to check out at the library. The next nutrition program will be in November.